This is what obsession looks like – plus it is too cold for the camera to work outside today. So I finished a pair of socks, and put them, and cast on a new pair. 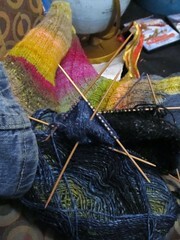 The yarn is Japanese, from a company called Noro. The new ones have silk in them, and a slightly less crunchy texture to the fabric. Still pretty compelling, apparently!